Come in, come in, we musn’t lurk in doorways…. 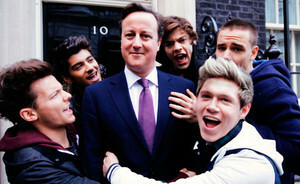 I wrote a piece for Independent Music News about musicians and politics after One Direction started tweeting about the budget. Music has the power to move us and make us do stuff we didn’t even know we could. I’m going to grab my partner and swing them round at a square dance, fo sho, and every time I eat vegetables, I think of The Ramones. Ray Charles only had to ask me once to bend over and shake my tail feather and I still don’t know what doing the mash potato means, but by golly will I do it. So it totally makes sense for musicians to do the loop-de-loop into politics and use their charm and swagger to influence fans for the greater good. Posted in culture, Lifestyle, music and tagged bands, david cameron, feature, george osborne, independent music news, music, one direction, politics, ray charles, the ramones. Bookmark the permalink.